Are you doing everything possible to protect your investors from excessive stock buybacks? The bread and butter of BlackRock’s business is the index fund. Index fund investors own every stock in an index, which means they end up owning companies that engage in unnecessary and risky buybacks. In my opinion, and as I’ll show below, index fund investors represent a specific class of investor that suffers real, measurable harm from misguided and ill-advised buybacks. An investor in an S&P 500 index fund ends up owning each and every stock in the index, for better or worse. This makes Blackrock’s vigilance so critically important. Index fund investors are passive – they must rely on their manager to defend their long-term interests. Index fund investors need CEOs to protect their long-term interests by reinvesting profits into research and development, pioneering new projects, and other growth initiatives. But too much is being spent on buybacks—and it’s hurting index fund investors. We believe BlackRock could be doing a lot more. Further down, we have a specific example—a case study of buyback disaster at Bed, Bath, and Beyond—but it’s first worth pointing out that most buybacks can be even more dangerous for long-term investors than people realize. This past summer, economist Robert Ayres and researcher Michael Olenick published damning evidence that the more companies do buybacks—the more those companies decline in value. Of 1,839 firms studied, Ayres and Olenick concluded that the firms that repurchased the least amount of stock (in proportion to their market value) saw their market value increase an average of about 250% over five years. But the 64 companies that bought back the most stock, saw a nearly 22% decline in value over the same time period. What does this mean? “For one thing, it means that firms that have “invested” in buybacks (to support the price of the stock and to keep the senior executives happy) have actually wasted money that should probably have been invested in the business, especially in R&D,” the authors conclude. Clearly, index fund investors have no such freedom. And it’s possible to measure “buyback damage” for index fund investors because there is a specific point in time when a company is added to an index, and a date when it is removed. In other words, there is a buy date and there is a sell date. Buybacks also involve cash and stock, making it very easy to calculate investor losses from buybacks each time a company is removed from the index. Who is advocating for long-term investors, anyway? Is anyone? On behalf of their customers, hedge funds make all sorts of noisy demands of CEOs and boards. They demand board seats, for instance, and they pressure corporate leaders for action on restructuring, large cost cuts, and company-wide reorganizations. Hedge funds even push for more buybacks in support of their customers, who have more of a short-term orientation than index fund investors. Hedge funds are also not shy about promoting the interests of their customers. With just 1 or 2% ownership of a stock, they’re often able to bulldoze their way into board seats, and frequently have their way with corporate leaders. BlackRock has far more girth than any hedge fund in the world. As you pointed out last month,BlackRock typically owns “5, 6 percent” of an S&P 500 company’s equity valuation. 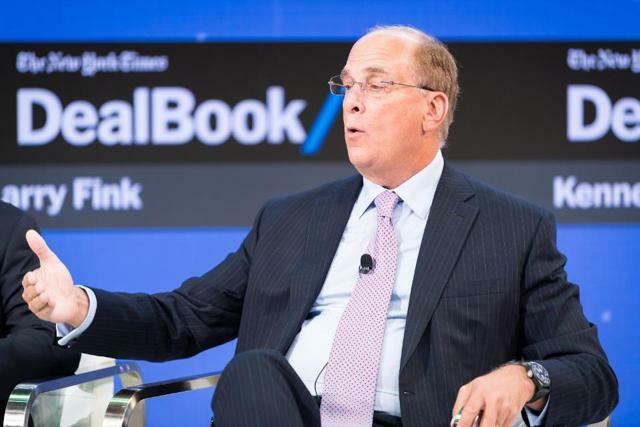 In our opinion, BlackRock clearly has the ownership muscle it needs to get things done on behalf of long-term investors. For example, Blackrock could (and should, in our opinion) offer an emphatic “No!” to companies which do buybacks when funded by increases in debt. BlackRock could pressure management to stop buybacks when the business is obviously shrinking. Spending cash on buybacks at shrinking companies can help meet quarterly earnings targets, but it can also destroy shareholder value, and increase risk for both the business and the shareholder. We recently completed an exhaustive multi-year study of buyback behavior at the thirty companies that comprised the Dow Jones Average from 2014-2016. Among many alarming findings: Businesses that were plainly and consistently shrinking continued their buybacks in robotic fashion. This will not come as a shock to you: There’s no free lunch with buybacks. When executives screw up and a buyback goes bad, somebody loses. There is real, tangible harm when a CEO pays $60 per share in a buyback—and the stock tumbles to $30. Consider the case of Bed Bath and Beyond. The retailer entered the S&P 500 on September 30, 1999. Back then, the company had a market cap just shy of $5 billion and the stock traded around $17.30 . Over the next 17 years, BBBY management spent $10.3 billion of cash on buybacks at an average price of $52.64, according to our calculations from SEC filings. Then, in July, 2017, Bed, Bath and Beyond was booted from the S&P 500 at a stock price of $28.31. Damage to index fund investors was severe. Cash of over $4 billion had been squandered in buybacks during the time the stock was in the S&P 500 index, from 1999 to 2017. As a result, index investors suffered a loss holding BBBY (dividends are included in our calculations) while a no-buyback strategy would’ve generated a total cash return in excess of 100%. If, instead of buybacks, BBBY executives had simply accumulated cash or paid out cash via dividends, we estimate index fund investors would have enjoyed a return of over 100%. Somebody has to pay, and that “somebody,” of course, is the long-term shareholder, the one stuck holding the stock after an ill-advised buyback. The harm, however, is not evident at first. When a buyback takes place, it may appear that all is well, as the stock might be helped by a temporary surge in demand. A debt-fueled buyback might look beautiful for a year or two or three. But not forever. The fact is, Bed, Bath and Beyond is an early warning shot for index investors—the tip of the iceberg. We predict that other buyback abusers—including Macy’s, Ralph Lauren, and specifically many other retailers—are at risk of being removed from the index. Since 2013, for instance, Macy’s management has spent $6.2 billion of shareholder cash on buybacks, more than the company is now worth (about $5.6 billion). Macy’s has accumulated large paper losses due to excessive buybacks. When Macy’s is inevitably removed from the S&P 500 those paper losses will be realized losses. Another, bigger example of the looming damage of buybacks: General Electric. Over the five-year period from 2012 to 2016, GE’s Jeffrey Immelt spent $42.8 billion buying GE shares at an average price of $26.24, according to GE’s SEC filings. Today, as of late November 2017, the stock trades around $18, a 30% loss to shareholders. Of course, GE’s stock price could miraculously recover, but more likely, the market has rendered judgment onto Immelt’s buyback binge: It was a lousy way to spend cash, given massive disruption throughout the energy complex. The world is shifting from fossil fuels to renewables, and instead of leading the revolution, GE is focused on the wrong things, like how many shares it needs to repurchase to make next quarter’s earnings per share target. Meanwhile, a hedge fund led by Nelson Peltz is calling for more buybacks at GE, and recently won a board seat at the firm. Trian owns just a 0.82% stake in GE. Where is the pushback from long-term investors? It’s troubling that Vanguard, State Street and BlackRock, who own a combined 17% of General Electric, do not have a single board seat to advance the interest of long-term shareholders. Why not? In addition to pushing back against excessive buyback activity, BlackRock could help long-term investors by demanding a lot more disclosure—including full disclosure of management conflicts of interest. It’s a dirty little secret about buybacks: The C-Suite is frequently and materially conflicted when making buyback decisions. It should be noted that CEOs and boards are able to hide behind SEC Rule 10b-18, which grants safe harbor to buyback purchases. Companies are not required to disclose conflicts. And so they keep it a secret. But what if a large, boisterous long-term investor stood up and said, “Enough!”? Full disclosure of conflicts is long overdue. It is the shareholder who pays the cost of buybacks, and it is the shareholder who takes on the risk. Since shareholders pay for the party, they have every right to know how many millions of extra dollars CEOs make because they choose buybacks instead of investing in innovation or paying down debt. So again, what is BlackRock doing to protect long-term shareholders from risky buybacks? Your letters and anti-buyback commentary make us believe that you’re aware of the scope of the problem. Earlier this year, you even expanded your corporate governance department to respond to shareholder concerns. You have the corporate muscle to respond. So is there any action planned? Worm Capital, LLC does not accept responsibility or liability arising from the use of this document. No document or warranty, express or implied, is being given or made that the information presented herein is accurate, current or complete, and such information is always subject to change without notice. Shareholders and other potential investors should conduct their own independent investigation of the relevant issues and companies involved in this article. This document may not be copied, reproduced or distributed without prior consent of Worm Capital. The opinions expressed herein are those of Worm Capital, LLC and are subject to change without notice. The company (or companies) identified or referenced herein is an example of a current or potential holding or investment target and is subject to change without notice. This information should not be considered a recommendation to purchase or sell any particular security. It should not be assumed that any of the investments or strategies referenced were or will be profitable, or that investment recommendations or decisions we make in the future will be profitable. Past performance is no guarantee of future results. Worm Capital reserves the right to modify its current investment views, strategies, techniques, and market views based on changing market dynamics. This article contains links to 3rd part websites and is used for informational purposes only. This does not constitute as an endorsement of any kind.